Food Mumbai Craves When it rains The onset of the monsoons brings a relief from the humid, heat wave of Mumbai. The rains are welcomed with open arms and a food craving that is unique to every individual. These food items are a part and parcel of monsoon just as the ripeness of mangoes, a tamarind treat, a chatpatta Kairi panna, or a chilly cup of ice cream in the summers. Vishnuji Ki Rasoi knows exactly what you feel like devouring when it rains. Here, we list five monsoon food items which are enjoyable at anytime, anywhere! 1. Samosas We can spice up and give a break to the gloominess of the drizzles with the wide variety of samosas to select from. Gone are the times when only potato samosas were available at roadside joints. Now, there is a wide selection from paneer samosas to veggie samosas. When teamed with sweet and tangy chutneys and chillies, Samosas blend perfectly well with the drops of water pouring outside. 2. Onion Pakoras/ Kanda Bhaji These kinds of bhajiyas are categorised as an easy snack of crispy fried onion rings with the tinkling of waters outdoors. It is prepared and served hot with tea, coffee or combined with dips to add flavour to Kanda bhajiyas. The warmth of pakoras results in counting them as being the top favourites of the foodies here. 3. Kadak Masala Chai The heavy splashes of rains chills us out, the same goes with a round of hot, steaming Masala Chai. Every cup has a secret - added flavour in every drop, different serving technique, even different serving utensils such as cups, kullads, pyaalaa (bowls) or even drinking out of a saucers. Out it all together, and you will find that some of our finest memories are associated with a cup of masala chai and ‘tip, tip, tip, tip baarish’. 4. Jalebi The downpours develop a craving for spicy foods but also lead us into temptations for warm and mouth- watering thin jalebis. A lot of people combine jalebi with chilled dahi (yoghurt) to create a sweet and sour, hot and cold double impact! Another way is teaming it with rabdi which add to its sweetness and its juicy texture. Many people gel it well with spicy eatables which compliment it as a contrast to the other aromas, flavours and tastes. What a perfect, drool-worthy companion during Mumbai rains! 5. Chaat The final entrée on this list are the unforgettable chaats like paani puri, bhel puri, and sev puri. These chaats are really amazing for their tangy taste mixed with a sweet taste of chutney and, to top it all, assorted teekhi chutneys and crispy farsaan. Each topping can be adjusted as per your liking. Adding to the flavour of the puris are potatoes and chickpea ragada garnished with onions and coriander leaves. Chaats are definitely a hot favourite among the foodies of Mumbai when it rains. Vishnuji knows that food and rains go hand in hand. 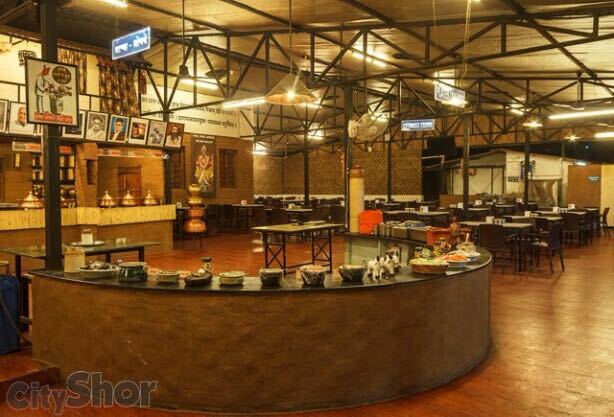 Which is why we offer all these delectable monsoon feasts in the comfort of our dhaba themed restaurant. So when Mumbai craves masala chai, chaat, samosas, pakoras or jalebis – head on down to Vishnuji Ki Rasoi at Thane, and we will make sure you go home satiated! 50 % off -/ on Buffet Thali . Support Mumbai Indians for the IPL final on Sunday -21 st may . Watch live telecast and win 50 % cash back if MI wins the trophy through Gift coupons . Having an insatiable craving for some #Mumbai style #StreetFood snacks? One such snack that tops the list and is the soul of street food is #MasalaPav A spicy & tangy dish with a generous topping of butter...Simply heaven Think no more and head straight to Vishnuji Ki Rasoi Thane for this lip-smacking dish now!!! Craving for something hot & crispy while its #Raining?🌧️Visit Vishnuji Ki Rasoi Thane now to satisfy your taste buds with the undisputable king of #Mumbai street food #BatataWada served with some spicy and tangy chutney. Punjabi Thali in Thane. If you belong from punjab and stay in Thane, Mumbai with friends there is no worry you will get Punjabi Thali in Thane at Vishnuji Ki Rasoi with desi tadka of Punjab.